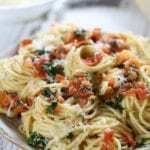 Fresh tomato caper sauce surrounds luscious al dente pasta. A light and savory dish perfect with a chilled glass of white wine. Fill a 6 qt stockpot 3/4 of the way full with cold water. Bring to a boil over high heat. Once boiling add enough sea salt to make the water taste like sea water (3-4 tbsp). Add pasta and bring back to a boil, stirring occasionally to ensure noodles do not stick together. Cook to al dente, with a slight firmness and almost done. Taste testing is the best way to achieve al dente. Once cooked drain and set aside until tomato caper sauce is complete. Meanwhile, as the water for the pasta comes to a boil, prep remaining ingredients. Once the pasta is cooking, place olive oil, garlic and rosemary in a large skillet pan over med/low to med heat. Heat just until garlic begins to bubble, about 3-5 mins. Add capers and continue to heat for another 2 mins. Raise the heat a bit, add the tomatoes & simmer just until they begin to fall apart, about 2-3 mins. Add parsley & cook for another couple of minutes. Toss in al dente noodles. Top with freshly grated Parmigiana Reggiani cheese.